Detective Philo Vance first appeared in a series of novels written by S. S. Van Dine. In his original incarnation Vance was a stylish fop, but by the time he made his way to radio many of his arrogant edges had been smoothed out, giving him the charm he often lacked on the printed page. 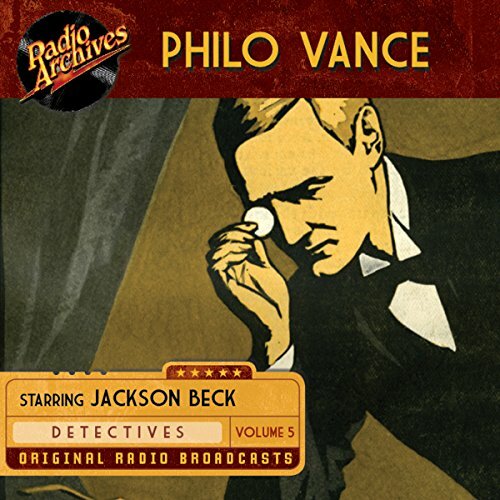 In 1948, played by the inimitable Jackson Beck and supported by Joan Alexander, Vance deduced his way through 104 baffling mysteries in a syndicated series that would continue to be aired on local stations throughout the 1950s. If you love playing armchair detective, you can't go wrong with Philo Vance, particularly this first volume of 20 fully restored shows. Detective Philo Vance first appeared in a series of novels written by S. S. Van Dine. In his original incarnation, Vance was a stylish fop, but by the time he made his way to radio, many of his arrogant edges had been smoothed out, giving him the charm he often lacked on the printed page. In 1948, played by the inimitable Jackson Beck and supported by Joan Alexander, Vance deduced his way through 104 baffling mysteries in a syndicated series that would continue to be aired on local stations throughout the 1950s.